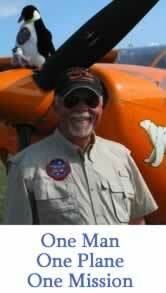 Contact - Contact Art Mortvedt for speaking opportunities and more information about Polar Flight 90 for L.I.F.E. Home - The Flight of the Polar Pumpkin continues! Follow Art Mortvedt and the Polar Pumpkin's 2013 solo journey to the North Pole. 2013 Flight of the Polar Pumpkin - Success! Read this year's Flight Log and follow along on our Flight Map. "So it was now time to Park the Polar Pumpkin. 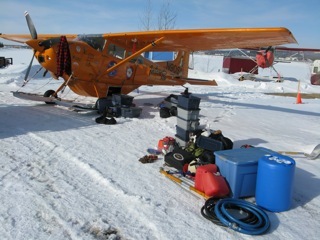 I taxied across the Fairbanks International Airport to my parking spot - from whence I departed on March 20 - and completed the "North" portion of Polar Flight 90 - flying the Polar Pumpkin from Fairbanks to the North Pole and safe return. Thereby is the successful culmination of Polar Flight 90 - the flight of the same single engine "Polar Pumpkin" Cessna 185 to both the Geographic South Pole and the Geographic North Pole." Read more on the continuing journey home. Are you keeping up with the Polar Pumpkin on Facebook? Like our page for all the breaking news! Solo flight to the Geographic North Pole in Cessna 185 N90SN - North 90 South to North. Art Mortvedt, Alaskan Bush Pilot, with 5,000 hours flight experience, 20+ expeditions to Antarctica, and 6 seasons of scientific logistics in the North Polar ice pack. From Alaska, through the Canadian Yukon Territory, the Northwest Territory, and the province of Nunavut to the North Pole & return. To demonstrate the applicability, practicality, and economy of ski equipped single engine aircraft to Polar Science. To land the same Cessna 185, N90SN, at both Poles (South Pole Nov. 22, 1999). To honor the historical contributions of single engine aircraft to Polar Science. To determine and document effects of Global Warming and Climate Change. To clarify the critical importance of Polar Regions to science and the health of our planet.